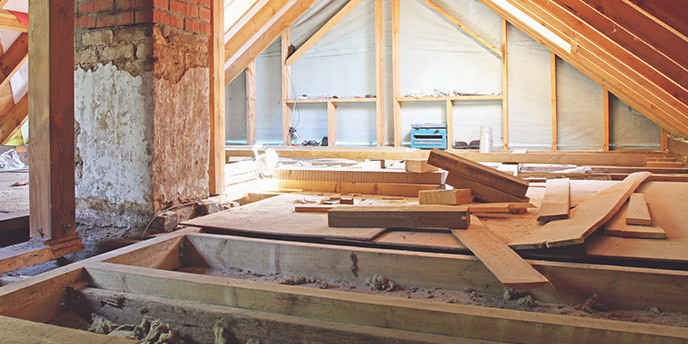 Interested in transforming your unfinished attic into usable living space? Whether you’re in need of an extra bedroom, office or playroom, a DIY attic remodel is a great way to add space to your home without paying for a whole home addition. 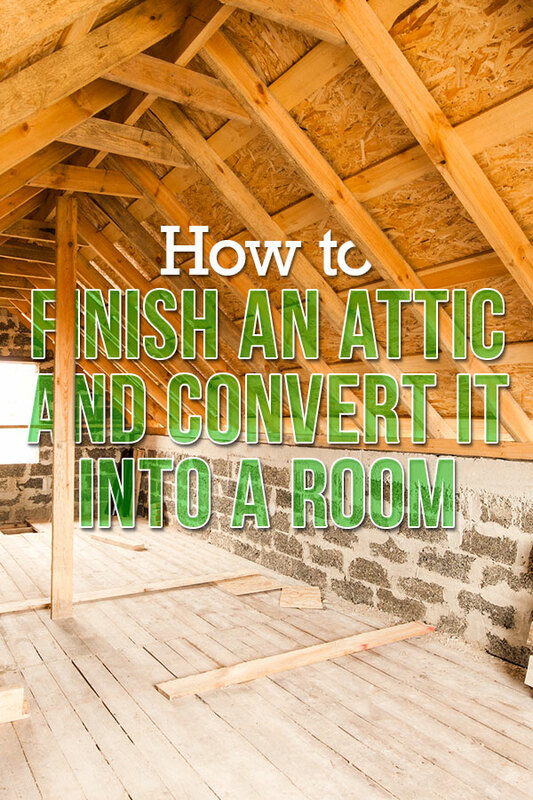 Use this guide to learn how to transform your space from exposed rafters to a finished room. Have at least 7 feet of vertical clearance in the majority of the room, be a minimum of 7 feet wide and have at least 70 square feet of space available. Be accessible by a full-size staircase. Have another exit in case of an emergency, typically an easily accessible window. If your attic is only accessible from a ladder or a pull-down staircase, you will need to build a permanent staircase before it can be used as anything more than storage space. Pro Tip: If most of your attic’s ceiling is under 7 feet tall, you can hire a professional to build a dormer to increase the height of the room. Reach out to your local permitting office to find out if you need a permit for your attic conversion. A permit is usually only needed if you are adding electrical wiring or ventilation, or if you plan to change the structure of your home in the process, such as knocking down an existing wall or adding a dormer. If your attic does not already have duct work, you will need to find out if your current HVAC system will support an additional room. Bring in an expert to look at the capacity of your current heating and cooling system and find out if additional ductwork can be added to reach your attic. If adding ductwork or HVAC capacity is beyond your budget, other options include baseboard heating and mini-spilt systems. In addition, have the contractor check for or install rafter vents to ensure air can move behind the insulation you will install to finish your attic. Rafter vents will keep your roof cool even while your attic is warm. The average cost of an attic conversion is $49,438, according to Home Advisor. The cost of the project will depend on the elements your project includes. If you are planning on a DIY attic remodel, you can expect to pay approximately $5,000 for materials including drywall, insulation and carpeting depending on the size of the attic. If your roof is supported by trusses, you will probably not have the space in your attic to build a room. You would need to relocate the trusses to create the space and ceiling height required by building codes. This would require an architect, engineer and a significant financial investment. Be realistic about your skill level when it comes to doing the work yourself. If this is your first remodel, consider hiring a professional to help you convert your attic. Before you begin converting an attic, you need to clean out the area and remove any old junk and building materials you will no longer need. Assuming you are going to add new insulation before installing drywall, remove any old insulation. If the insulation is loose or blown-in, use an industrial vacuum to remove it. If the insulation on your attic floor is in good shape, you can install subflooring over it. If it is old and compressed, consider replacing it. Once your attic is brought up to code and you’ve obtained a permit, hire a licensed electrician to ensure all wiring meets code requirements. By hiring a professional to install electrical wiring across the walls and ceiling, you can avoid many of the common problems DIY homeowners tend to come across. If you do the work yourself, you run the risk of electrical fires. As a rule of thumb, there should be at least one outlet on each wall and at least one outlet every 12 feet. If joists are visible on the floor of your attic, you will need to build a subfloor. Start this process only once all electrical and ventilation installations are completed. To reduce sound traveling from your finished attic through the floor to the rest of the house, you can add insulation under the subfloor paneling or choose a thicker subfloor panel. Snap a chalk line that marks the center of the joist for its full length. The edge of the panels should sit at this mark. Lay the first panel along the attic’s longest wall ¼ of an inch from the wall. The longest edge of the panel should run parallel to the floor joists. Drill 2 ½ inch screws into the floor joists every 6 inches. Install the next panel with a ¼ inch gap between the existing panel. When installing the next row, avoid placing end seams on top of one another. Repeat process until floor is covered. Caulk all seams and screw heads. 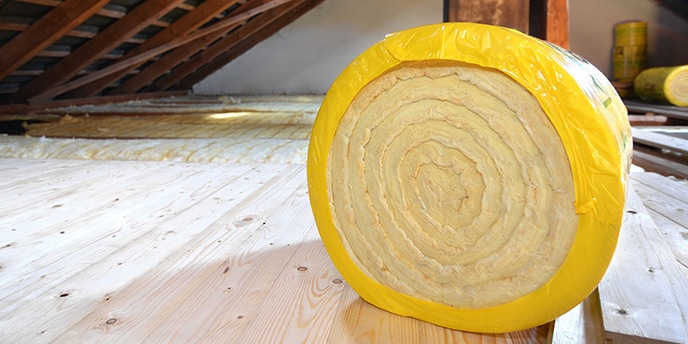 For a DIY project, the best insulation for an attic is batt insulation with a vapor-retardant facing. This insulation is great for finishing an attic because it is flexible and easy to install and can even be layered for additional coverage. Before installing the batts, caulk any spaces or leaks where air can pass to the rooms below. 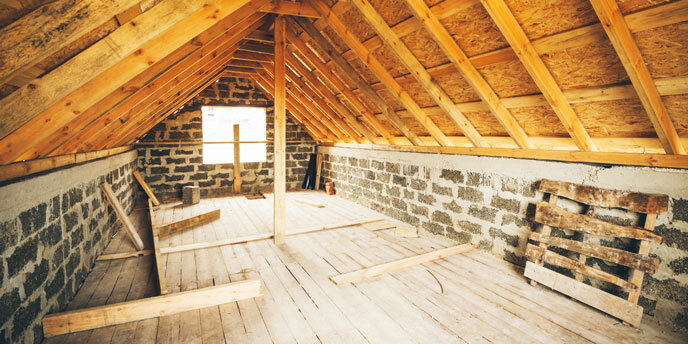 Batt insulation is usually cut to fit between standard wall joists and 8-foot-high walls. Attic walls are not always this tall. If the batts don’t fit, trim pieces with a utility knife. Insert insulation into the cavity between joists the vapor barrier facing the room and not the external wall. Try to compress the insulation as little as possible to avoid reducing the insulating value. Staple the insulation into the joists as directed by the insulation manufacturer. Continue process on all attic walls and on the ceiling. If you need to insulate behind pipes or electrical wiring, peel the insulation apart and create two layers and fit the layers around the obstacle, making sure the vapor barrier is facing the room. Once you’ve finished installing the insulation, it’s time to finish your walls. Hanging drywall will really make your attic conversion take shape. Hang drywall horizontally from your exposed studs and secure with drywall screws. Finish by covering seams and screws with drywall mud. Depending on the height of your ceiling, you may be able to choose a dropped ceiling for a more finished look, but if you need to conserve space to meet building code standards, install drywall directly to the ceiling as well. Next, paint your drywall and watch as your attic starts to look like a real living space. New drywall will need to be primed prior to painting. After priming, add at least two coats of paint to give the drywall a finished appearance. If you used drywall on the ceiling, paint it before starting on the walls. When choosing colors for your attic room, consider lighter options, especially if the room has few windows and little natural light. You’re almost finished with your DIY attic remodel. Your next step is to choose and install flooring for the room. Carpeting is a good option for an attic because it helps reduce sound and adds additional insulation to your floor. Follow installation guidelines based on the flooring of your choice. Next step, decorate your converted attic! Now that your attic includes painted walls and finished floors, move in furniture and décor to make the room the living space you need.